I have a 1965 StarCraft with a 120 HP MerCruiser - it has a MerCruiser 1A, 1B or 1C outdrive - my mechanic thinks that a Alpha 1 lower unit will bolt on to the Upper Unit - can anyone tell me for sure?? CONGRADS on finding an I/O STARCRAFT. 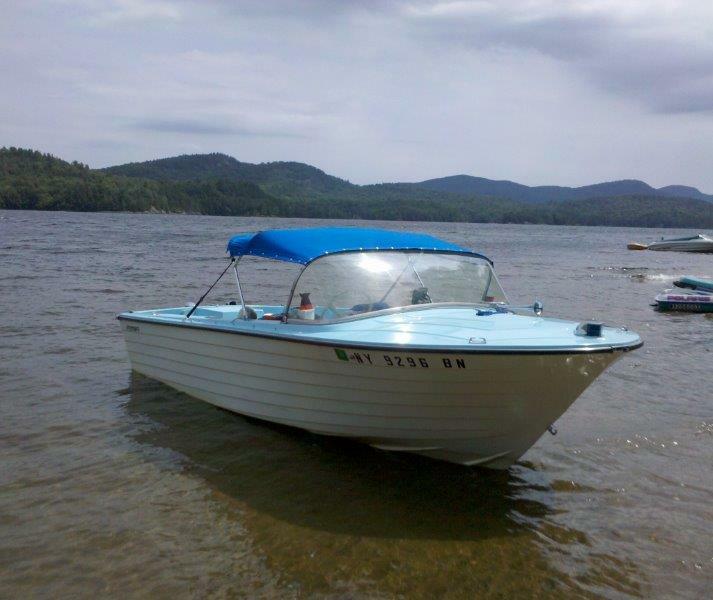 Thanks - and just so you understand - this boat has been in my family since it was purchased new in 1965. Just needs a new lower unit. There is a photo of her in my profile - but I have no idea how to get it to show here! NEAT. - ImVho, still having a "family boat" after nearly a HALF CENTURY makes it a TREASURE to your descendants! No, the early MerCruiser #1 drives have a large spline (10 I believe) drive shaft and the later drives from about 1970 and later use a finer spline (13?). Also, I don't think your unit has the interconnected oil passage making the entire upper and lower unit one for lubrication purposes. Another thing to consider is you must have EZ shift also or you will have problems shifting out of gear. JM - thanks for your reply - I'm not sure which drive I have - or whether I have the EZ shift - I do have a single lever shift mechanism, and from what I remember its some kind of electronic shift gizmo - is this what they call EZ Shift. How can I tell what model the drive is? Serial # is nowhere to be found! If you have the cutout switch on the shift linkage near the back of the boat then you have EZ shift. (Note: I am not talking about any reverse lockout switch or valve). #1) 1st generation about 1962 & 63. Used a 14" dia prop max. #1A,B,C) 2nd generation until about 1965. Used 16" dia props, had 3 gear ratios. #1A,B,C with EZ shift) 3rd generation. Similar to the unit above but had EZ shift. I believe they may have had the interconnected oil passage - truthfully can't remember. Let me note that the above units had an assortment of manual and power TILT systems over the years. You will find a few different tilt cylinder and shock absorber cylinder arrangements. 120/160) From 1967 thru 1969 and a few early 1970 models. These had power TILT standard and optional TRIM in 1967, TRIM became standard in 1968. 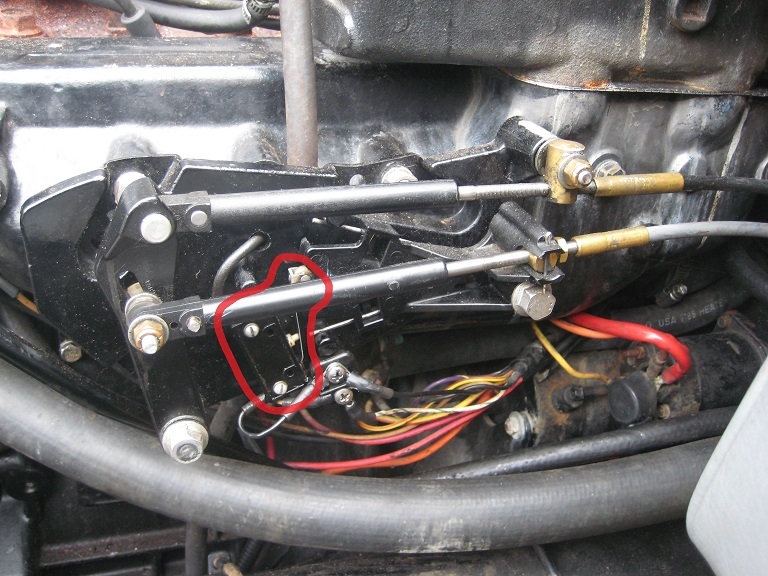 The tilt and trim systems used different sized cylinders and mounting hardware so the upper housings were slightly different at the rear cylinder mounting location on 1967 models. They had interconnected oil passages and the course splined drive shaft. Also used a prop shaft with a square shoulder for the thrust hub. 120/140/165) 1970 and later was eventually expanded to 260 HP. Then becamem the R unit in 1982 (squared looking cornes), the MR unit about 1984 and Alpha 1 about 1986 (MR was actually an Alpha and looked externally the same as the R drive). They all used the fine spline drive shaft and tapered prop shaft. There were a series of internal design changes over the years. So the later ones were a bit stronger to handle the higher HP engines. For a 4 or 6 cyl, any will be fine. So you have a 1965 boat which I assume has tilt only and maybe some type of early shock system and mechanical down latch with a release lever on the drive. That makes you need to keep your upper housing and find a replacement lower 1/2. It won't be as simple as bolting on a complete later assembly. There is one more thing to point out. There were slight differences in the bell housing and upper unit mounting flange. Very early drives had thin flange, then later a thick flange. But while they look similar, they have a slightly different centerline and won't interchange. From 1967 until 1982, all were the same. You can install an Alpha Gen 1 onto a 1967 or later boat using the Alpha gasket set. There were 2 different gaskets used prior to 1967. About the serial number: It was on a decal on the upper unit. It should also be stamped into the upper unitunder the decal I believe. WOW quite a bit of info there! Of course the boat is a ways from home, so I can't try to locate the serial # until the end of November - But can you explain what/where the cutout switch is on the back of the boat? Is this in the engine compartment or somewhere near the drive? If you are referring to the switch that does not permit the boat to be started in gear - I have that - or rather had. It quit a couple of years back. I also have a gizmo on the drive unit itself that says "Lock" I believe that it prevents the drive from kicking up - we never used it and it is seized in the unlocked position. I do have "Full Power Tilt" - no power trim. Look up high behind the motor for a similar bracket (disregard the location in this picture - yours will be up high & hard to reach) where the shift cable comes from the remote control and interfaces with the cable going to the unit. If it has the fork & switch that I have circled, you have EZ shift. Thanks - will try to do during Thanksgiving weekend! If I buy a new transom kit - will this solve the problems with the splines etc? Yes I am still here. I believe that changing the entire transom plate would be required in order to use a 1967 or new drive. But then the rear engine mounts & exhaust may create some problems that need to be resolved. Consider that 1967 and newer only had one set of hydraulic rams (well, 2 actually in 1967 because Full Power tilt models has smaller diameter rams & mounting hardware) and completely different pumps. Also, the pump was different between the tilt & trim models. So, changing the transom plate assembly will also require a new pump & hoses. At that point I wold look into a cheap but complete junk boat/motor and work forward. Argh - I guess nothing is simple - I called Mercruiser on this one and they have to go to the "old timers" to get an answer! They MAY have an answer for me next week. Last year we broke the windshield and I found a twin boat that I would have bought in an instant if it hadn't already been sold! Could have used her for parts and avoided all of this mess. I got a quote from one dealer for a complete new power drive and he wanted over 17k - My mechanic thinks he can get the trim ram seals rebuilt - but the handwriting is on the wall on this one!